Moods are matched with colors in this jazzy picture book. Jamie is having a really great day, feeling purple and just being. But when his brothers kick him off the couch, his mood turns stormy gray. As he draws, his mood turns green and easy. Then his older brothers make fun of his drawing and Jamie’s mood turns black. Basketball gives him a swishing orange mood and running home almost late has him racing red. Family dinner is lemon pie yellow and washing up brings on tides of bluesy feelings. The day ends with that same cold plum purple mood as it began with. What color is your mood? Brown’s poetry has a jazz beat and lots of metaphors that make it dance in your mind. Children will immediately recognize the moods and easily relate the colors to them. From the teasing of older brothers to the pleasure of making art, Jamie’s moods are universal. Brown’s writing begs to be read aloud, written so that it tumbles off the tongue. Evan’s illustrations have a jaunty vibe that matches that of the poem. The art is digital collage created with oil paints and graphite. The illustrations have a great depth of color, something that makes this book all the more vibrant. They also have a wonderful texture from the paint and from swirls in the color. This is a positive way to look at complex emotions and would make a great book to start a discussion about feelings and moods. Appropriate for ages 4-6. Valley’s mother was killed by the black helicopters while she was out in the garden when Valley was four years old. Raised by her father, she has been taught to hide at all times. There is a den in their house where she and her brother Bo can never be found. Valley knows above everything else that Those People will kill her without even thinking about it, just like a coyote. But now Valley is out of the house and on the road with explosives strapped to her and the trigger waiting for her to decide exactly when to use it. When the first explosive goes off prematurely, Valley is left on her own in a world she has had little contact with. But Valley knows how to read people and how to manipulate them, right up to the end she is in complete control. Or is she? This taut thriller turns the world on its head. Valley’s story is told in flashbacks so readers know that they are learning the backstory of a domestic terrorist. And what is amazing about the writing and the storytelling here is that despite that knowledge, readers will begin to understand Valley and the way she was raised and how she came to be the person she is now. That alone is a tremendous achievement. Then there is Valley herself. A girl who is bitter, strong and lonely. She has lived much of her life in the company of only her father and brother and much of that she spent hiding completely alone. She is bright and fierce, burning with a hatred for Those People that her father carefully instilled in her. And she is wrong, oh so very wrong, about the world and about others and about her own family. She is flawed and ever so human under that bomb. Well written and carefully paced, this book is tantalizingly taut and thrilling. In the end though, it is about a girl caught in a web of lies that she cannot see past. Appropriate for ages 15-18. 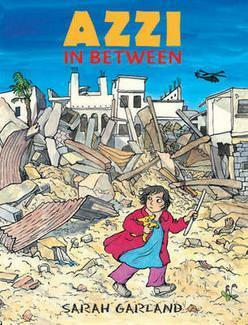 The winner of the 2013 Little Rebels Children’s Book Award has been announced. This is the first year for this British award that recognizes the best radical children’s fiction that promotes social justice and is awarded by the Alliance of Radical Booksellers.